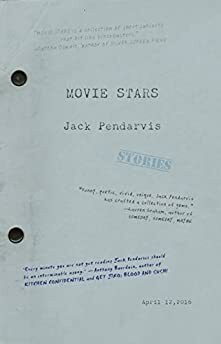 Largehearted Boy: Book Notes - Jack Pendarvis "Movie Stars"
Book Notes - Jack Pendarvis "Movie Stars"
Movie Stars is a magnificently droll new short story collection from Jack Pendarvis. "I like all of the yearning weirdos who wander through the work of Jack Pendarvis. You will like them too, because he reminds us we are all yearning weirdos, looking to the stars, movie and otherwise, for some fate and guidance. These stories are true ha ha funny, courageously strange, humane and affecting, and really, really good." I eventually replaced it, but the original epigraph for the book was a song lyric: something from the closing theme of the Bob Hope movie Cancel My Reservation. It's what I can only call a fake Osmond Brothers song, which is funny, because the Osmond Brothers sound like fake Jackson 5. So it's a fake of a fake. I like the Osmonds, don't get me wrong. "One Bad Apple" was on the playlist at my last big birthday party some years ago. The closing theme from Cancel My Reservation is like a horrible mutation of "One Bad Apple." So I was mesmerized by it. But quoting it in the epigraph came off as too arch. If only I'd put as much thought into the rest of the book. The story that might have the most music in it is called "Your Cat Can Be a Movie Star!" There's this hapless narrator who wants to impress a louche bartender, so he cooks him dinner and labors over a special playlist for the evening. The playlist is a success—maybe too much of a success, because the narrator finds his wife dancing provocatively with the bartender to the B-52s song "Strobe Light." The narrator is suddenly a little appalled by the racy lyrics about kissing a woman "on the pineapple." Then a Bobby Short song comes on and nobody seems to like it, which sends him into a spiral of self-pity. I bought Will Friedwald's A Biographical Guide to the Great Jazz and Pop Singers, and he had a lot of compelling things to say about Bobby Short. Consequently, I went through a Bobby Short phase. I don't specify which Bobby Short song my poor narrator puts on his playlist, but I think it might be "You Fascinate Me So," which is fake Cole Porter, keeping our theme going. I don't know who actually wrote it but they're obviously paying respects to Porter, and doing it very honorably and well. There's a line, "You're like the finish of a novel that I'll finally have to take to bed," which I think is pretty clever. I just remembered that the narrator of "Your Cat Can Be a Movie Star!" has ambitions to write a children's book about Scriabin. Ever since I was a kid I've been fascinated by Scriabin. He picked at a pimple and caught gangrene and died. But up until then he had big plans. He wanted to bring about the end of the world with a piece of music. He envisioned a form of composition that used lights and smells as well as sound. John Hodgman has called my characters "yearning weirdos" and I suppose I have always identified with the type. Which reminds me: there's a composer in my story "Ghost College" who has the orchestra put into a trance before they play. But I was thinking of the Herzog movie Heart of Glass, for which I hear he hypnotized the actors. I didn't have an actual composer in mind. I often listen to visionary composers while I write, though: Charles Ives, Messiaen, Anthony Braxton, Sun Ra. I'll get into a mood for several days where I just want to put on the same thing every morning by one of those guys and start writing. My composer in "Ghost College" is trying to complete an opera about Benedict Arnold, which reminds me of something Virgil Thomson might have done. But my composer is British, I think, so maybe he's more like Vaughan-Williams, who used a wind machine in one symphony… his symphony about the South Pole, maybe? And my guy goes to the Himalayas to research a composition about the yeti. I usually can't write to anything with lyrics. But I went through a long phase of listening to Janacek's opera The Cunning Little Vixen every day while I wrote. According to iTunes, I listened to it sixty-five times. There's one aria that contains a piercing scream, though, and after a while I'd get too tense wondering when the scream was going to happen. I could never remember. So I had to stop listening to that. Two collections I listened to repeatedly as I wrote were the Complete Savoy Recordings of Charlie Parker and a Fletcher Henderson box set called A Study in Frustration. Lots of Schubert and Schumann too. I don't like that part of Crimes and Misdemeanors when Martin Landau tells Anjelica Huston that Schumann is "too flowery." He's going to have her murdered later, remember. It reminds me of a teacher who urged me to scoff at Shelley. "I fall upon the thorns of life, I bleed!" he'd say in a sarcastic voice. Now I like Schumann and Shelley. Poor old Schumann. For a while there he thought ghosts were dictating melodies to him. That's in his "Ghost Variations." Brahms did a nice set of variations on that same theme in tribute. But the Schumann I listened to most while writing Movie Stars was a set of fragmentary pieces called Papillons.